Hello! Today I am up on the SVG Cutting Files' Cut Club Blog. I made this kitty cat scrapbook page with selections from February's Bundle. Just need to add a photo of our cat to complete the page. 😻 The pattern paper is Anna Griffin's Best in Show and I love the kraft paper with the "scratches" on it. Find out about the advantages of joining the Cut Club, HERE. Here is a closer look at the page title cut. I cut the cat out in orange to match the fur of our kitty cat. Thanks for looking at my scrap book page today! Hi! Today I am posting on the Jaded Blossom Blog with this cute mushroom box. I found this design at Silhouette Store and thought it would be adorable with Jaded Blossom's Gnomies Forever stamp set. Gnomies Forever is on sale this month. 😎 I made a tag with Heart Dies and tied that to the mushroom box. The base of the box is trimmed with a grass die. Here is a closer look at the tag. I used a hole punch to attach the twine to the heart. Hello! Today I have a preview of a file that will be at the SVG Cutting Files' Store this Friday. He is called Chibi Bear in Pot of Gold. He is on Jaded Blossom's newest treat topper die, Ric Rac Treat Topper. 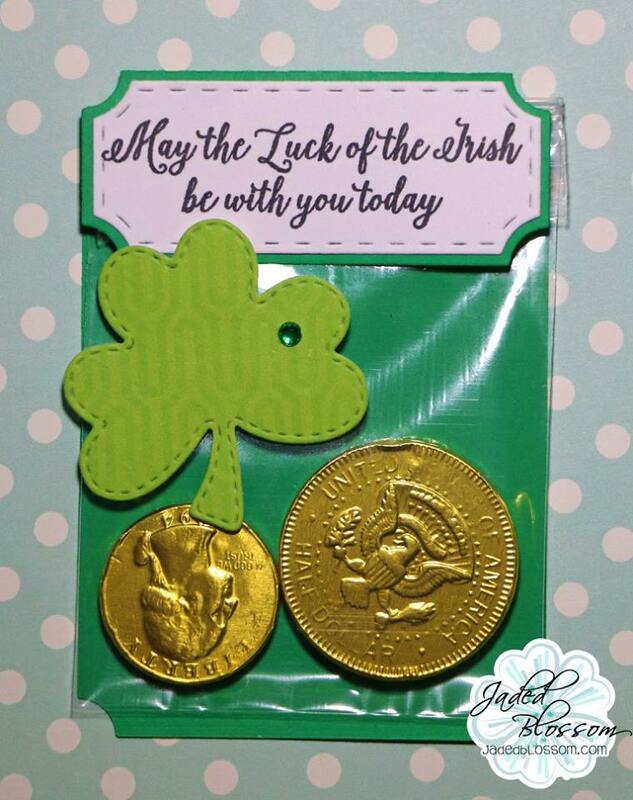 I filled a bag with gold coins to make a sweet treat for St. Patrick's Day. 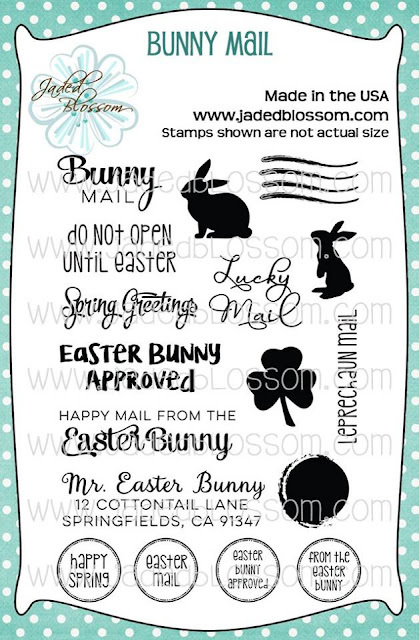 I decorated up a mail truck with stamps and dies from Jaded Blossom's February Release. The Bunny Mail stamp set inspired me to create this cute mail truck for "bunny mail" treats. I fussy cut the rabbit from Easter Basket Basket Fun. He looks so cute driving with all of his decorated eggs. Here is a close up of the treat tag with the NEW Spring Word Dies. This is what the cargo door looks like open. 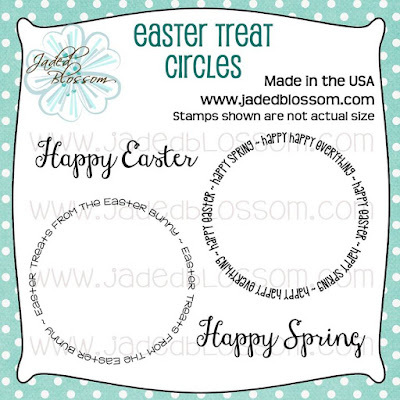 The polka dot egg is cut with Jaded Blossom's Stitched Oval Dies. Hello! 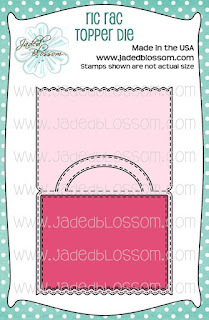 Welcome to the last day of Sneak Peeks for Jaded Blossom's February Stamp Release. We have a new stamp set called Bunny Mail and of course the freebie stamp. Here is an Easter Treat I made with Bunny Mail stamps and the New Ric Rac Treat Topper. The rabbit is from the Larger Spring Dies which were a limited die set at this time. 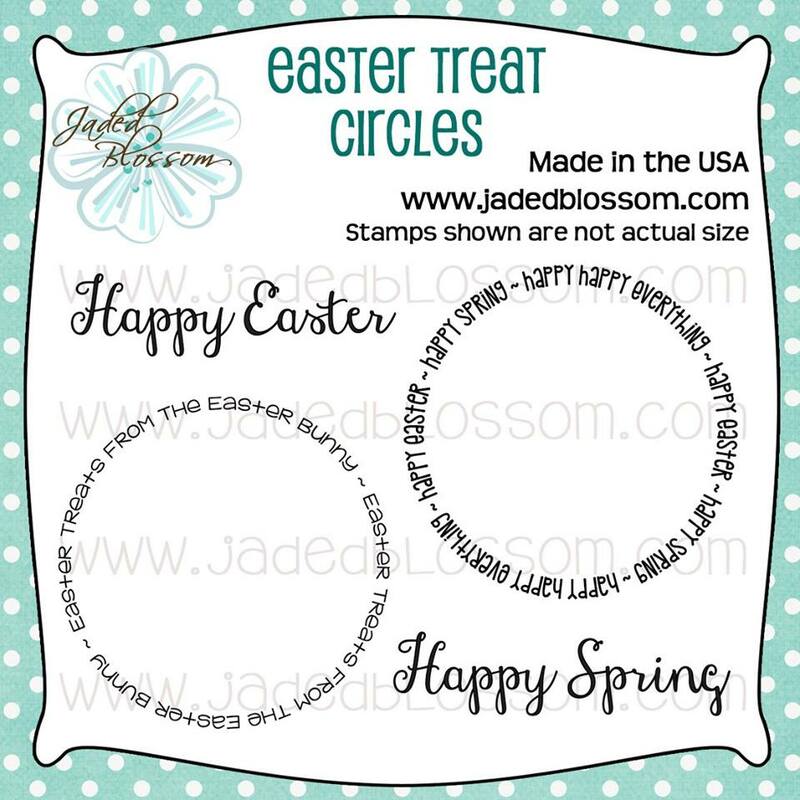 Love the larger version on Jaded Blossom Spring Dies. I am also up on Stamp Anniething's Blog today. 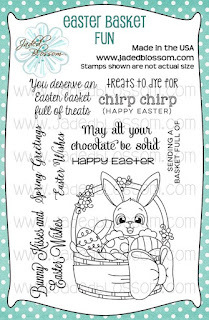 I colored their rabbit stamp, Bunny Hugs to You and placed her on Jaded Blossom's New Ric Rac Treat Topper. The sentiment is included in the freebie stamp for February, Easter Treat Circles. Thanks for stopping by today. 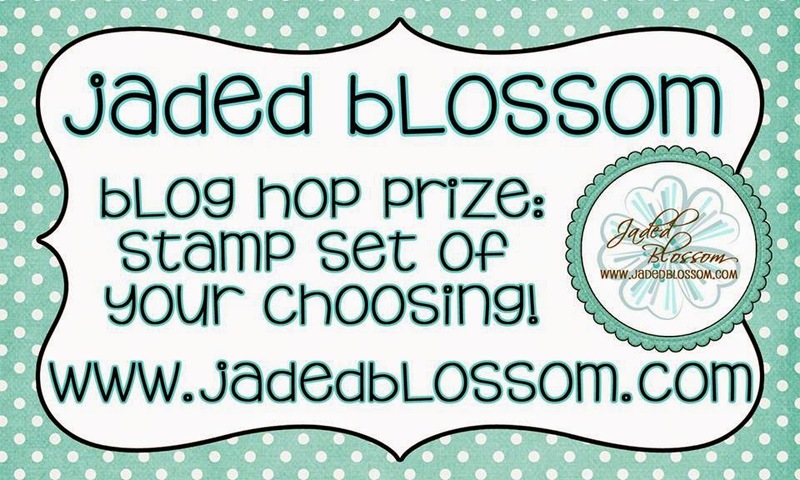 See you at 4pm PST for Jaded Blossom's Stamp Release Blog Hop. 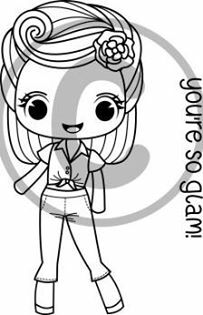 Welcome to Jaded Blossom's Sneak Peeks Day Four. We are showcasing two new stamp sets today, Conquer the Laundy and Kawaii Cleaning. Love the sentiments on Conquer the Laundry. I made a card with one of the sentiments from that set. The background was made by stamping the laundry basket from the Kawaii Cleaning stamps. Thanks for checking out my card today. 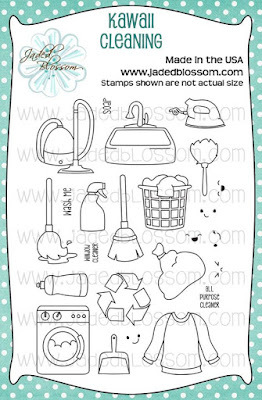 Jaded Blossom has more projects created with these adorable stamps. See you tomorrow! 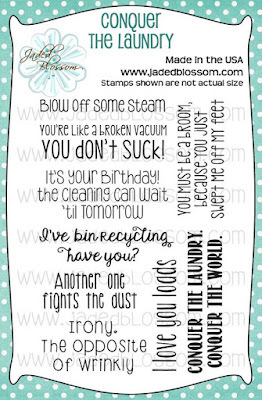 Welcome to another sneak peek of Jaded Blossom's February Release. Today we are revealing two new stamps, Go Green, and Holiday Dress Up. Here is my project featuring an Easter Girl from Holiday Dress Up. To put the rabbit ear head band on her head, I first stamped the rabbit ears. Then I stamped another on a post-it note. Next, I cut the post-it note out and placed on the first stamp of rabbit ears. 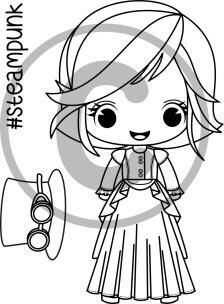 Lastly, you stamp the girl image. You can do this to put any of the accessory hats on the girl image. She was colored with Copic Markers and put on Jaded Blossom's Candy Caddy. Here is a peek inside the Candy Caddy. I turned the tray upside down and punched some holes to hold the eggs. 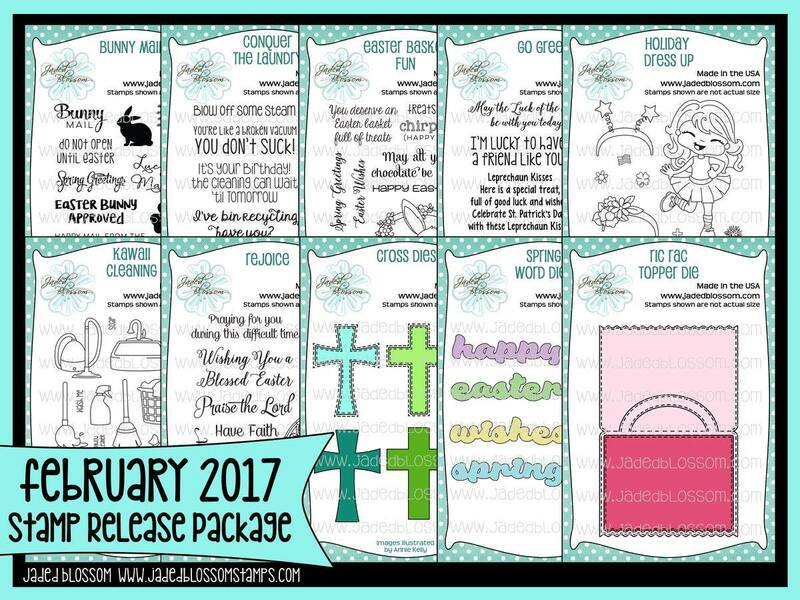 Stop by Jaded Blossom to see more projects created with these stamp sets. Jaded Blossom February Sneak Peeks Day Two :: Rejoice! Welcome to the second day of Jaded Blossom's Sneak Peeks. 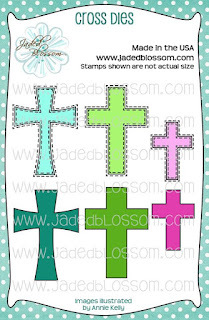 Today we "Rejoice" stamps and Cross Dies. I made two project featuring the new Cross Dies. First is this sweet First Communion Box. I added the smallest cross die to the front of her dress. Next I have a treat topper using the NEW Ric Rack Treat Topper. I found this sun rise cut for the background and layered the cross on top. He has risen indeed! Thanks for stopping by today, check out the new projects at Jaded Blossom. See you tomorrow for another sneak peek. Hello! Today I am sharing on the SVG Cutting Files' Cut Club Blog. To create this page, I used cuts from the February 2017 Bundle. The sketch is from Page Sketch 19. I added a tittle and bone shaped dog tag to complete my page. Easy Peasy! Which is nice because this little dog keeps me BUSY. I added my puppy's name to the dog tag. Daisy is a long hair miniature dachshund. The paper and chipboard accents are from Imaginisce "Good Dog" collection. Members of the Cut Club earn discounts, get personalized files, and more! Learn more about the benefits of Cut Club Here. Hello! 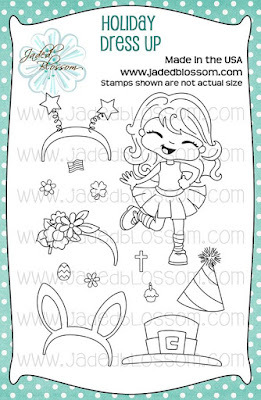 Today is day one of Jaded Blossom's February Stamp Sneak Peeks! We have two new die sets and a new stamp set to preview. I have two projects made with the new release. 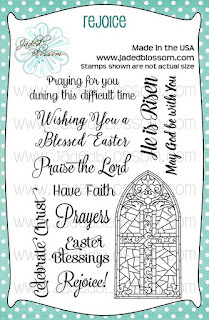 First is a card made with the new stamps from Easter Basket Fun and the Spring Word dies. I just HAD to color that cute bunny and basket. The stamp is colored with Copic Markers and the grass is washi tape from Queen and Co. Here is a closer look. The "happy" was cut in white two times and then I layered the pink on top. Next I have a rabbit treat holder. I love the sentiment from Easter Basket Fun and thought it would be perfect for this sweet bunny. 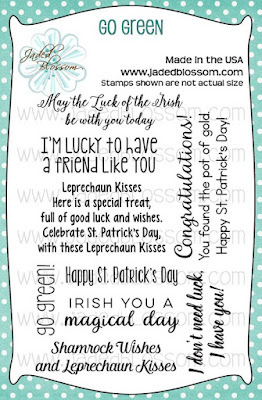 Stop by Jaded Blossom to see what the design team has created with the new dies and stamps. See you tomorrow with another sneak peek! Here is my card made with the New Maggie Stamp. I stamped the hat separate and added after I colored up the girl with Copic Markers. Gear embossing was created with a folder from Darcie. The gems are from Prima. The card base was made with dies from Jaded Blossom. Head on over to Stamp Anniething to see more projects created with the NEW Maggie Stamp. Today we are showcasing the new Dean stamp. He is so cool! I love how the design team has colored him up. Different color combinations really give him a different vibe. Here is my card featuring Dean. I found this cute paper with the vintage records and though it would be the perfect backdrop for Dean. I colored the stamp with Copic Markers. Thanks for stopping by today. Be sure to stop back tomorrow for the finial preview. Head on over to see all the fabulous samples at Stamp Anniething's Blog. Hello Everyone! Today I am up on the Jaded Blossom Blog with Valentine Treats. I picked up the chocolate candy at my local grocery store and thought my kids would get a kick out of them. I added hearts from Jaded Blossom's Valentine Dies to one of the emoji faces. 😍 The larger hearts behind the faces are the NEW Heart Dies 1. 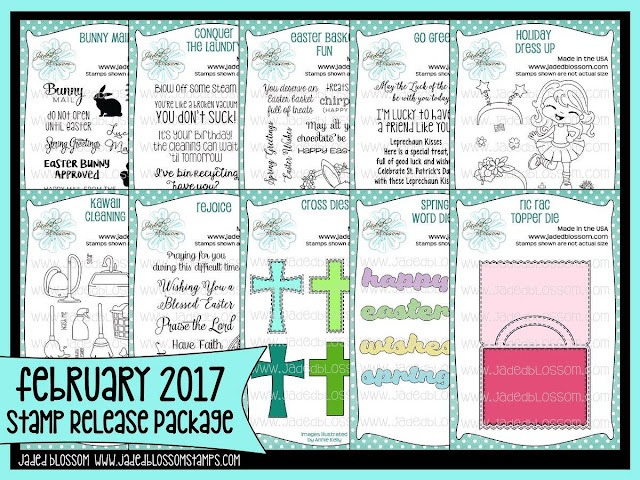 Stamp Anniething's February Release. Here is the stamp we are showcasing today. Here is the card I made with the New Betty Lou stamp, her retro look is so cute. I colored her with Copic Markers. I used dies from Jaded Blossom to create the card base. Thanks for stopping by to see my card. 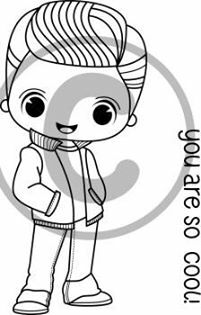 Be sure to visit the design team blog to see more created with this cute stamp, HERE.